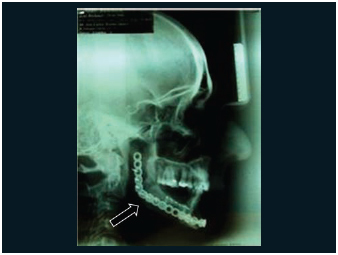 Introduction: The treatment of patients with Mandibular Osteoradionecrosis is challenging and almost always followed by complications. Objective: to describe the treatment of patients with mandibular osteoradionecrosis after radiation therapy to the head and neck area and its complications based on MARX's protocol. Method: Retrospective study of five patients presenting mandibular osteoradionecrosis after radiation therapy to the head and neck. They were surgically treated in Hospital Santa Catarina in the city of Blumenau - SC between the years 2004 and 2007. Results: One patient was submitted to segmental mandibulectomy followed by rigid reconstruction associated to iliac graft; three patients were submitted to a segmental mandibulectomy followed by rigid reconstruction without grafting and one patient was submitted to a marginal mandibulectomy. 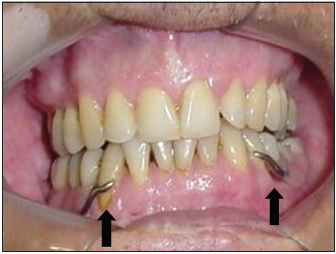 In two cases there was closure of the intraoral wound and absence of pain. There was an opening of the cutaneous wound with plate exhibition in three cases with large resection without grafting and microvascular reconstruction was indicated. Conclusion: The purpose of therapy of the craniofacial osteoradionecrosis is the end symptoms, the possibility of tumor recurrence and shape and functional restoration. Several methods can be used. From our point of view, the classification of the osteoradionecrosis described by MARX is a great guide for the approach of these patients and possible complications. Osteoradionecrosis (ORN) of facial skeleton is one of most severe and debilitating complications which may occur after radiotherapy in patients with head and neck cancer. 1,2. The need to study the etiology and the treatment of such kind of pathology and its standardization in terms of its treatment made several authors do research. Regaud, 3 in 1922, was one of the first authors to describe ORN. Since then, such pathology has been designated by several terms, following etiological, pathogenical and clinical characteristics, such as radiation osteitis4, avascular bone necrosis or post-radiation bone necrosis (5). Mandible is the main area which is attacked by such pathology. The difference between its blood supply and anatomical structure may make it be more affected than maxilla (6). ORN is clinically presented as persistent pain and chronic bone exposure (7), and it may cause non-bone bond, pathologic fractures and orocutaneous fistulae. 6. The main impact in such patients is concerning vital functions of digestion, respiration and speech. One of the first signs of ORN is pain, which should be considered in risky patients. 8 The progression of the problem may cause ulceration and pathologic fracture of mandibule, but the presence of such conditions is not necessary for ORN diagnosis. 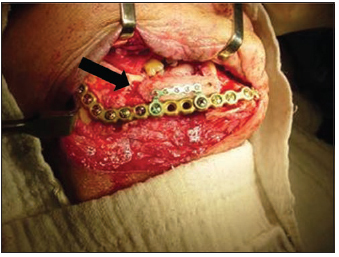 Ang E. 8 noticed that there was relaxation and lack of screws associated with ORN in his patients who presented mandible reconstruction blades. Its physiopathology is explained by Marx 9, referring to "3H principle" to explain the effect of radiation in tissues. In his model, radiation causes hypoxia, hypovascularity and hypocellularity of tissue, thus inhibiting substitution of conjunctive tissue and of cells to complete the turnover for the maintenance of homeostasis and wound cicatrisation. The affected cells are the ones of vascular endothelium, fibroblasts which make stroma and parenchyma cells. Physiopathology is the result of radiation effect not only on bone but also on the soft tissue of the coverage. However, there are reports which say that radiogenic effects appear first in osteoclasts, before appearing in vascular system (10). 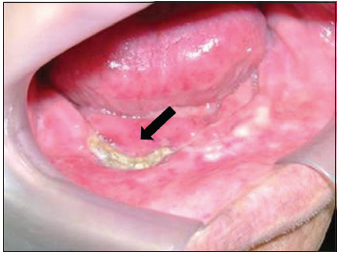 Many factors have been suggested to develop ORN, including tooth extraction before and after radiation, 6,11 poor oral hygiene together with smoking and drinking habits, periodontal disease, hyperfractioned radiotherapy, 12 radiation doses which are higher than 5000 Gy and place of primary tumor, especially the ones which affect mandibular surfacing mucosa. 13 There is even a report which says that infection accelerates ORN process (14). Incidence is around 4 and 30 % of patients who undergo head and neck radiotherapy. 1, 15 ORN of maxilla and skull base are rare and may be seen in combined therapies in treatment of malign lesions of maxillary sinus (16). Conservative treatment with antibiotic use, sequestrostomy or hyperbaric therapy may be enough for patients with limited ORN, 11 however patients with well-defined lesions involving great bone areas and soft tissues and who present ulcers, fistulae and bone exposure require more radical treatment. It is ideal to treat this pathology in its initial stage before its progression to advanced stage. Treatment of other maxillofacial areas apart from mandible should also be similarly treated, with removal of harmed soft and bone tissue and reconstruction to restore function. The treatment of such patients include conservative measures, such as the establishment of proper oral hygiene, oxygenotherapy, antibiotics and surgical measures varying from limited resection, sequestrum removal up to mandible reconstruction with vascularized graft. 8 Jisander S. et al 17 contra-indicates non-vascularized graft in irradiated areas due to its high incidence of complications. This study aims at describing the treatment of patients who have mandible osteoradionecrosis based on the protocol established by Marx and its complications through retrospective study of five patients who had mandible osteoradionecrosis after radiotherapy treatment of head and neck, surgically treated in Santa Catarina between 2004 and 2007. 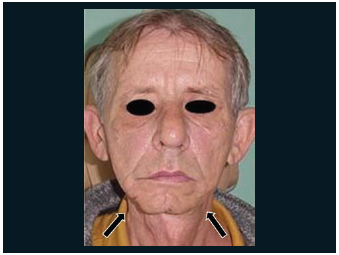 A retrospective study was done in five patients, four men and one woman aging from 54 and 68 years old, diagnosed with osteonecrosis after radiotherapy treatment of head and neck and who were treated with surgery in Hospital Santa Catarina de Blumenau - SC between 2004 and 2007. 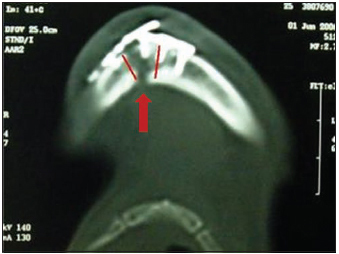 In four cases the diagnosis was processed through intraoral bone exposure, relaxation and loss of synthesis material of mandible region, producing mobility of bone stumps and pain. The blades and screws were in the region for osteosínthesis of mandibulotomy used as access for surgery of resection of primary tumor of mouth floor. In one case there was pain and intraoral bone exposure. The average time between radiotherapy and osteoradionecrosis lesion appearing varied in 26.4 months. Three patients underwent surgery to remove blades and screws followed by regional mandibulectomy and reconstruction by 2.4-mm blade for further forwarding to microsurgical reconstruction (Pictures 1, 2, 3 and 4). All three cases underwent thirty hyperbaric sessions before the surgery and ten ones after the surgery. Picture 1 - CT scan which evidences basilar lesion of mandible with loss of synthesis. 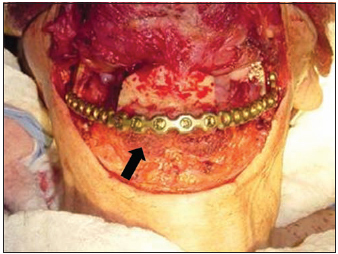 Picture 2 - Intrasurgical aspect of blade fracture and relaxation of screws associated to mandible lise. Picture 3 - Fragments of necrosed bone of bilateral region of mandibular body. Picture 4 - Intrasurgical aspect of reconstruction blade keeping mandible contour. In another case, there was facture of synthesis material with loss of teeth occlusion, but without intraoral bone exposure seven months after radiotherapy. In this case, we chose to remove the blades and the 2-mm screws and to reconstruct the iliac bone through free graft associated to 2.4-mm blade and 1.2-mm system to fix the graft to the blade. (Picture 5, 6). Rehabilitation through teeth prosthesis happened three months after (Picture 7). 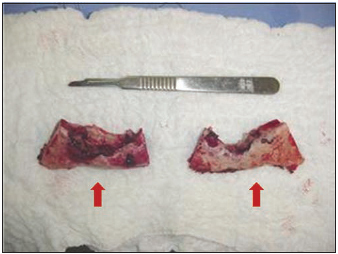 Picture 5 - Intrasurgical aspect of osteonecrosis of mandible body together with fracture of synthesis material and deviation of fractured stumps. 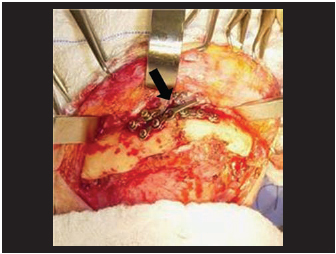 Picture 6 - Reconstruction through locking blade together with graft of iliac bone. Picture 7 - Prosthetic rehabilitation. In one case, the patient presented bone exposure and pain after mandible tooth extraction (Picture 8). He had undergone radiotherapy to treat a non-surgical tumor of oral floor thirty months before. Segmental mandibulectomy was chosen through intraoral access, with careful opening of soft tissues, live bleeding of remaining tissue, abundant irrigation with saline solution under pressure and primary closing of soft tissues. In this case, thirty oxygenotherapy sessions were performed before the surgery and ten after the surgery. Picture 8 - Intraoral aspect of mandible exposure. The material used for reconstruction in all patients was 2.4-mm Loking, using all reconstruction principles of load bearing of AO-ASIF, in which there was first blade positioning, removal of screw heads and their displacement for further resection of harmed areas and repositioning of blade. The access way for all segmental mandibulectomy cases was the supra-hiodea cervical way and for the marginal mandibulectomy the intraoral access was used. In three cases there was exposure of synthesis material after skin fistulization. Such fistulization varied between 17 and 40 days after the surgery, and there was indication for microsurgical reconstruction. We believe such complication was caused by poor vascularization of the skin coverage tissue and of mucosa. In the case in which we used free graft of iliac integration with partial remodeling of graft and maintenance of mandibular edge with preservation of mandible function and face aesthetics was observed three years later (Picture 9 and 10). Picture 9 - Profile X-ray which evidences maintenance of mandible contour. Picture 10 - Facial aspect three years after reconstruction with graft of iliac bone. In the case of segmental mandibulectomy there was dehiscence of suture after the surgery with bone exposure which was treated with new intraoral intervention for mandibuloplasty, and the wound was then completely closed. Osteoradionecrosis is a late complication and a complex deficiency of metabolism and of tissue homeostasis, induced by radiation, with development of bone necrosis and obliteration of small and big vessels. 18, 19 Such complication usually happens after a latency period which may vary from months to years and it is progressive, and may happen during the whole life of a patient. 20 In the cases treated by us we observed its occurrence from seven to thirty months. The treatment of such complication was performed through recommended classical principles to deal with infections, such as removal of cause, debridement, drainage and therapy with antibiotics. 21 However, such concept was changed by Marx in early 1980's, when osteoradionecrosis was defined as a non-healable wound due to an endioarteritis (22). In our experience, we treated three cases with total regional mandibulectomy followed by reconstruction by 2.4 mm blade, one case of mandibulectomy and free graft of iliac bone and one with segmental mandibulectomy. All cases underwent thirty hyperbaric sessions before the surgery and ten ones after the surgery. There are several classifications for mandibular osteoradionecrosis 21, 23, 24, however, from our point of view, the protocol idealized by Marx for staging and treatment of osteoradionecrosis together with surgery and oxygenotherapy was considered the most effective tool to approach such patients, being thus used by our clinic as standard approach. - Stage I - Patients present bone exposure in the irradiation area which does not heal for at least six months, there is no presence of pathological fracture, skin fistula or bone lise in the basilar of mandible. The treatment for such phase is described with thirty sessions of oxygenotherapy at 2.4 atm for 90 minutes. Patients who benefit from such approach present a relaxation of irradiated bones, spontaneous sequestrum of exposed bone and formation of granulation tissue. Even so, they will undergo tem more additional sessions for total cicatrisation. - The patients who were not successful with such treatment will follow Stage II - They are patients who have a great area of non-vital bone which could not be reabsorbed and/or sequestered through angiogenesis induction through oxygenotherapy. Such non-viable bone requires surgical debridement. Such approach should be done in a way which does not harm the blood supply of adjacent tissues, performed in intra-oral way with limitation of reflexation of soft tissues. Such treatment includes extraction of involved teeth element and bone resection until live bleeding of bone remaining is achieved. The surgical flap is then primarily closed and the patient undergoes ten more oxygenotherapy sessions. Patients who are recovered with such treatment may be rehabilitated with teeth prosthesis. - The ones who evolute to dehiscence of surgical wound with new bone exposure will be considered in Stage III - they are the ones which have great bone exposure area and non-viable soft tissues. Such stage should be approached with total regional mandibulectomy, bone stabilization, followed by ten oxygenotherapy sessions, with planning of further mandible reconstruction, which should usually happen after three months. Therefore, patients included in the last stage are the ones who did not have benefits with stage I and II treatments or the ones who initially presented pathological fracture, skin fistula or osteolisis in mandible basilar. The role of oxygen in homeostasis of normal tissues and in wound healing is crucial and provides restoration of integrity of both bone and hard tissues. Collagen synthesis, bone formation, bactericide activity of leucocytes, deposition of matrix for angiogenesis, all is under effect of cytokines and under physiological tension of oxygen in tissues (26,27). Oxygenotherapy is the only procedure known which reverts late tissue changes caused by irradiation, once it brings an increase in the concentration of oxygen gradient and distributes it to affected areas (28). Osteoradionecrosis of craniofacial skeleton is a sever complication of head and neck radiotherapy, and may be acute or appear later. Main complications observed were exposure of synthesis material, extra-oral fistula, relaxation and loss of fixation screws. Oxigenotherapy presented better cicatrisation of soft tissues in irradiated wounds. No recurrence of primary tumor was observed. 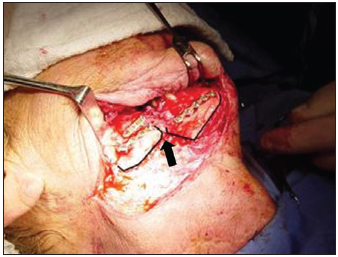 Free graft in irradiated mandibles should be indicated with care, once there are great chances of total reabsorption of graft, but it should be presented as a treatment option to patients in cases of lower proportion. The advantage of organization of diagnosis and treatment through the protocol established by Marx is in its ability to select those patients who present conditions to undergo less aggressive treatments, less oxygenotherapy sessions, besides preparing patients for reconstruction, thus keeping facial contour and avoiding collapse of cervical-mandibular soft tissues. 1. Student in charge of Oromaxillofacial Traumatology and Surgery department of Hospital Santa Catarina and Santo Antonio de Blumenau S.C. (Medicine student at Universidade Regional de Blumenau-FURB). 2. Master degree on Surgery. Partnership with FURB/UFPR (Person in charge of Head and Neck Surgery department of Hospital Santa Catarina and Hospital Santo Antônio de Blumenau - S.C.). 3. Medicine student at FURB.